A century from opener Ruvindu Gunasekera, complemented by a fine bowling performance from medium-pacer Jeremy Gordon, helped Canada stroll to an eight-wicket win over Netherlands in King City. Netherlands, put in to bat, had a slow start, losing both openers Michael Swart and Michael Rippon to the seamers Gordon and Cecil Pervez within 14 overs. Eric Szwarczynski, batting at No. 3, revived the innings with a brisk 57 off 72 deliveries. He smashed 10 fours and added 82 for the third wicket with Tim Gruijters, as Netherlands stabilised. Pervez, brought back into the attack, got the breakthrough for Canada, trapping Szwarczynski lbw in the 35th over. His wicket triggered a collapse, as the visitors, unable to deal with Canada's pacers, lost the last eight wickets for 32 runs. Raza-ur-Rehman, took four of those wickets, conceding eight runs off 8.3 overs. Gordon also took four wickets, including three in successive overs, as the pair bowled out Netherlands for 164. Gunasekera led Canada's first innings, hitting 21 fours and two sixes during his 173-ball 150 to take Canada to 436. He put up crucial stands of 73, 112 and 87 for the fourth, fifth and sixth wickets with Ashish Bagai, Salman Nazar and Jimmy Hansra respectively as Canada established a lead of 272. Netherlands medium-pacer Vivian Kingma struck three early blows but the visitors found things difficult once Canada's batsmen had settled down. Facing a vast deficit, Netherlands had another shaky start as Gordon and Harvir Baidwan dismissed Swart and Rippon in the first three overs. Gordon, who finished the match with figures of 8 for 149, then dismissed Gruijters to leave Netherlands at a precarious 45 for 3. Szwarczynski, however, counter-attacked with 85, and was involved in a 99-run partnership for the fourth wicket with Daan Van Bunge, who made 54. Szwarczynski eventually edged a delivery from Gordon back to the wicketkeeper Bagai, but the visitors showed more mettle and resistance in the second innings, as Wesley Barresi, Tom Heggelman and Pieter Seelaar all made useful contributions. Seelar led the lower-order resistance with an unbeaten 75 as Netherlands managed to wipe out the deficit but failed to open up a big enough lead, before being dismissed for 336. 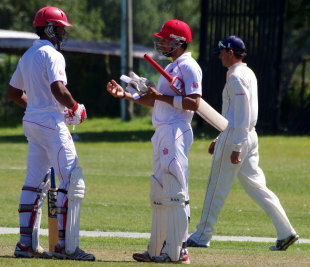 Pacer Harvir Baidwan complemented Gordon's effort, finishing with a four-wicket haul in the second innings. Canada took 43 balls to reach the 65-run target, led by a 24-ball 44 from Gunasekera. The win took Canada up to fifth in the Intercontinental Cup table, one point ahead of Kenya, while Netherlands finished last.